Money is energy. If we continue to pour our anger, hate and fear into money it will continue to hold us hostage. 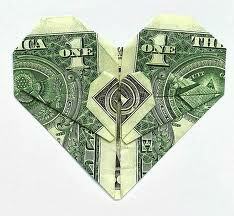 In today’s world we need both Money AND Love. Pouring your Love, Creativity and Positive Energy into Money will heal the divide and unite the 1% AND 99% into ONE ….. and our systemic oppression will lift. Hate attracts Hate. Love attracts Love. Barbara Wilder wrote a thought-provoking book entitled MONEY IS LOVE; Reconnecting to the Sacred Origins of Money. War, poverty, hunger and crime are caused by the fear that surrounds money and its scarcity. Money is energy, and energy is limitless. Only our fear and our limited way of thinking make money seem scarce. You can reconnect with the sacred origins of money, and direct the flow of money through your life and the world on a current of love, joy, goodwill and abundance. Money is energy, and according to quantum physics the universe is made up of energy, which becomes matter only when information is focused on it. Wood is wood and not iron because of the information that forms the two different kinds of matter. Too many of us labor under the belief that money is “a necessary evil,” which is, more often than not, difficult to obtain. By changing our feelings about money from fear, anger, greed and scarcity, to love, joy, abundance and goodwill, we can change the way money moves through our lives and the lives of others all over the world. Transform your thoughts about Money, and Transform Life.